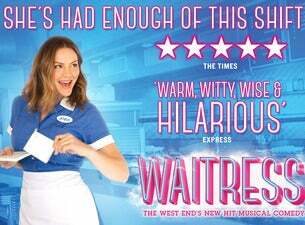 The Tony Award-nominated smash hit musical Waitress will have its official UK premiere in the West End next spring 2019. Currently playing its third year on Broadway, the show will bring with it an all-female creative team – a West End musical first – when it begins performances at the Adelphi Theatre in February 2019. Waitress opened on Broadway in 2016. Based on the 2007 motion picture written by Adrienne Shelly, it's the first Broadway musical in history to have four women in the four top creative team spots, with a book by Jessie Nelson, a score by six-time Grammy Award-nominated singer-songwriter Sara Bareilles, choreography by Lorin Latarro and direction by Tony Award-winner Diane Paulus. On its Broadway opening, Waitress was nominated for four Outer Critics’ Circle Awards, two Drama League Award Nominations, six Drama Desk Nominations and four Tony Award nominations, including Best Musical.